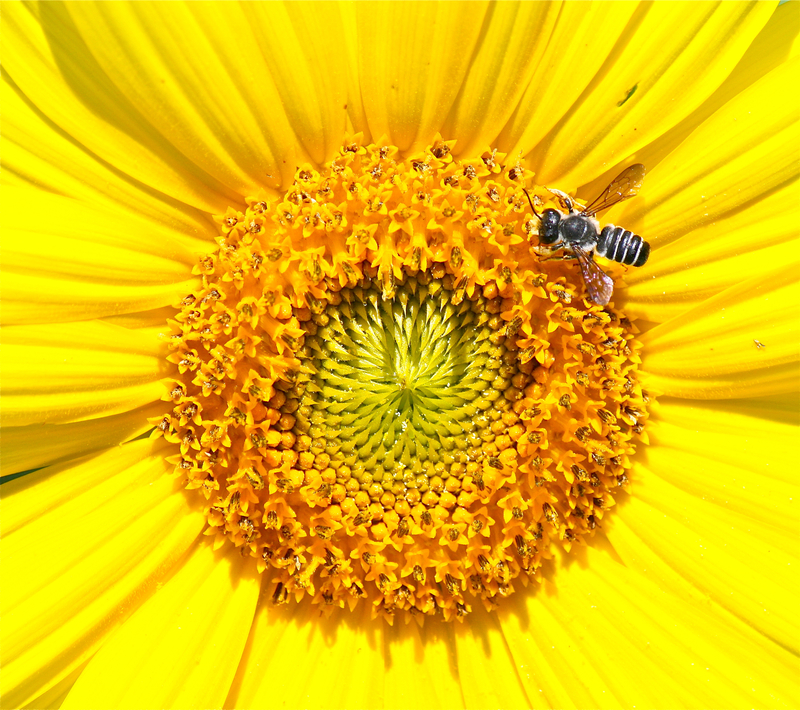 The new Moon at 03 degrees of Leo arrives as a beautiful open Sunflower. This is the sacred plant of Leo, and both are ruled by the Sun. The birds planted this one in my garden from the seeds I fed them all winter. Each new Moon is a seed planted in dark moist soil, a secret at the moment of conception, but a plan is already held in its design. The pattern of the Sunflower is both an invitation to open and shine, like the Leonic Sun, and a call to walk the circular path to the inner Self. This new Moon celebrates the arrival of the Sun to Leo where he is most at home. For those of us on the East coast of North America, the new Moon will take place at 6:41 pm on Saturday, July 26th. We have just finished a lunar cycle in the Moon’s sign of Cancer, now we celebrate the Sun in Leo. Cancer rules the fourth house in the astrology chart. This is the location of issues around the home of origin, where and how you grew up as well as the place where you live in this part of your life. Leo is located in the fifth house of creativity, love affairs and self expression. The House of the Moon and the House of the Sun are next to one another. We need a safe home to be creative and self expressive. Like the Sun, Jupiter has also recently moved from Cancer (the Moon’s sign) to Leo (the Sun’s sign). The three, Sum, Moon and Jupiter are in a rendezvous of joyous optimism and self confidence. This is our opportunity to feel the difference between egotism and self expression! The ego is always in a defensive position, while true self expression is a celebration of our gifts to share and the ability to appreciate the gifts of others. Jupiter’s optimism is boundless. He is the largest planet in the solar system, and promotes expansion and the energy to carry out what might otherwise look impossible. 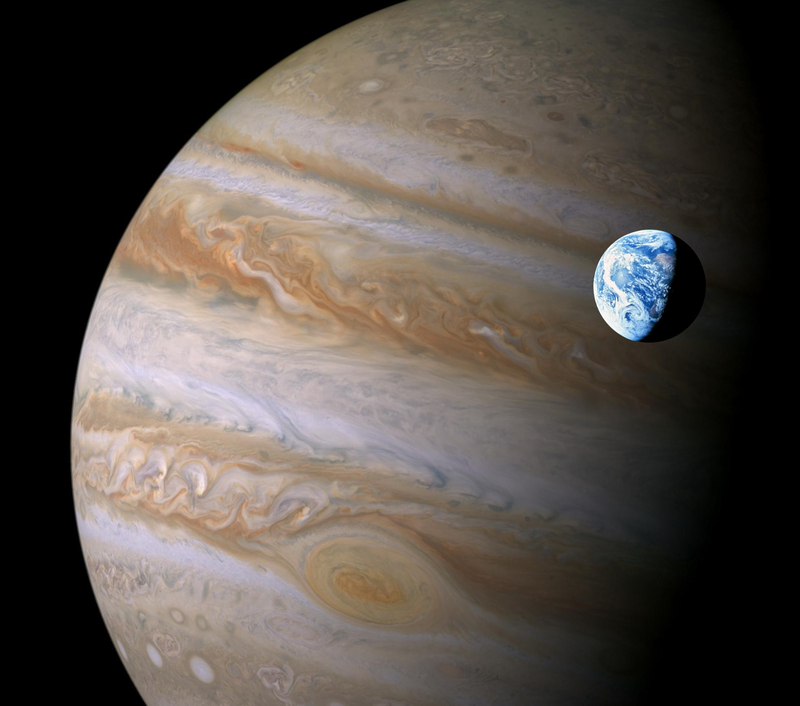 Jupiter has a huge magnetic field, and transmits more radio emissions than our Sun. After all, he is Zeus, the King of the Gods! I’ve had several astrology clients this week who were born with their Uranus close to this same degree of early Leo where the Sun Moon and Jupiter are located. This includes those born between 1955-7. The excitement and creative possibilities with Jupiter and a new Moon bouncing off your natal Leo Uranus (electric excitement, revolutionary possibilities) will provide the music for a cosmic dance! Just to make the mix even more powerful for all of us, Jupiter, the Sun and the Moon make a square to Mars who has recently entered Scorpio, which he rules from an underground station. He adds a hint of mystery and depth to this trio of great ones in the sunshine of Leo. Mars in Scorpio is very powerful in a behind the scenes way. His square to the bright light of Leo suggests that there is more than sunshine to this aspect. At his highest level he will give that lovely sense of possibility a focus to the powerful creative urges that are at work at this time. 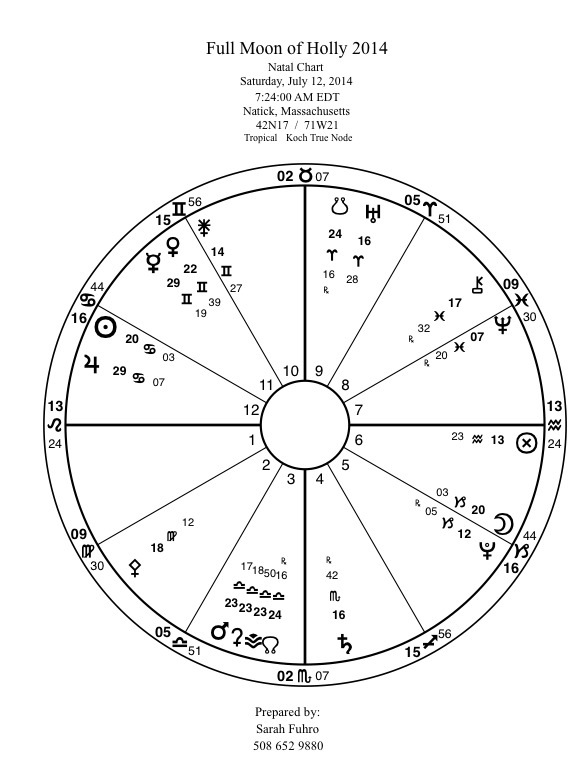 Pluto, lord of the underworld and Venus in Cancer eye each other across the chart. Like all oppositions they challenge us to think beyond polarities. To help that cause Mercury, also in Cancer is lined up to square Uranus, suggesting a unique way to think about old divisions. 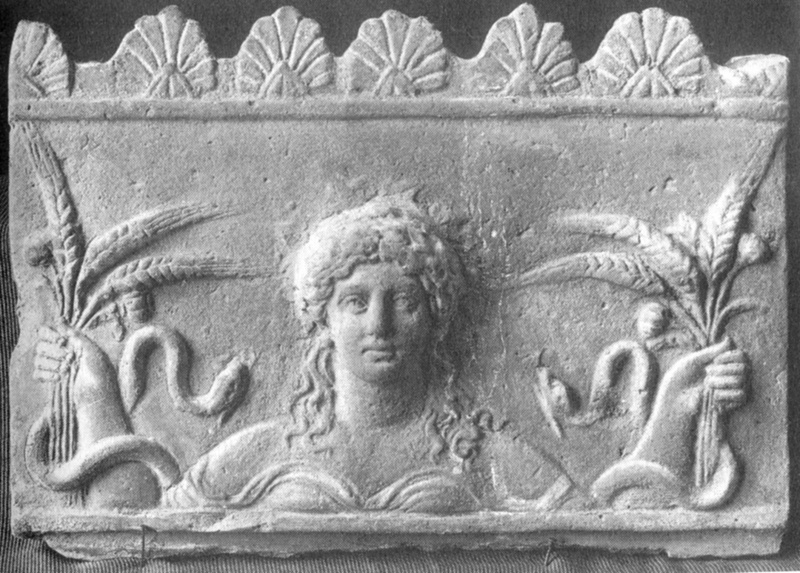 Most of us have our own black and white, positive and negative pillars we might consider in a neutral light like the High Priestess. Her power comes from her integration of opposites. 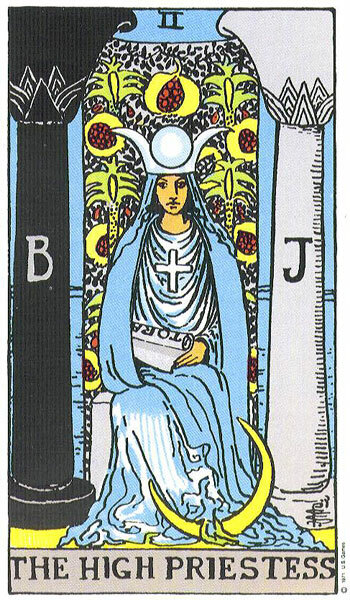 She sits between the pillars of dark and light, with the symbols of male and female on the curtain behind her, while she wears the crown of new, full and waning Moon. All steps of the cycle are open to her because she values the entire process. 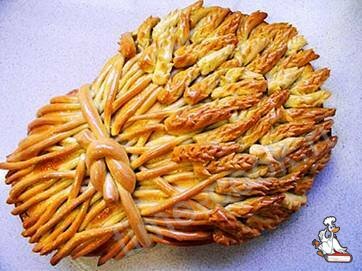 Lughnasadh or Lammas is celebrated around the 1st of August. This is the time of the first harvest festival and commemorates the change from hunter gatherer tribal societies always on the move to settled agriculture. 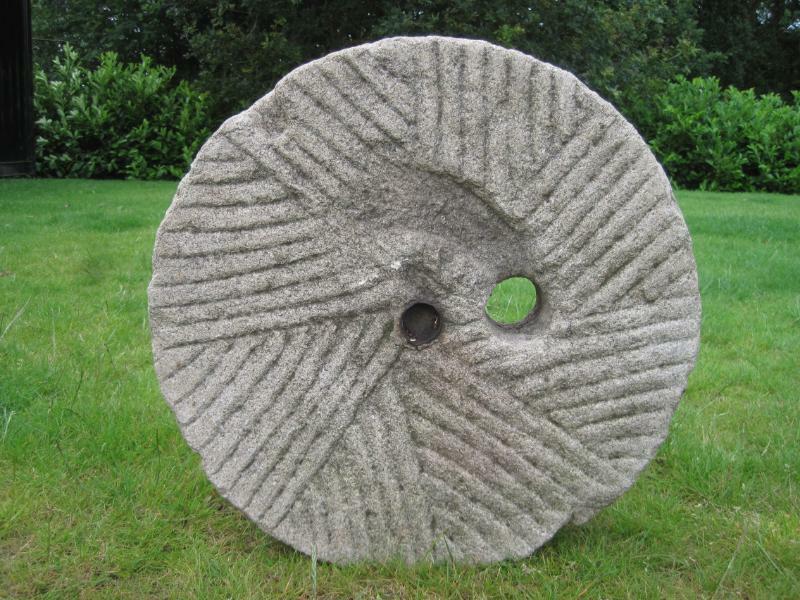 It is the season of bread and is the name for the month of August in Ireland, where traditional games are held in the honor Lugh’s foster mother who died as she plowed the hills for agriculture. It is a traditional time of weddings, but there is a sadness held in these days of harvest and sunshine. Perhaps it is a shared sadness with the cutting down of the grain, which has grown all summer. The light is beginning to retreat and there is a nostalgia for what was lost as the old paths of the ancestral migrations were forsaken, in exchange for the security of village life. grew in the sweet fields of May. fields of summer, where cicadas thrum. who lies hidden beneath the earth. May you dance under the Leo Sun with pleasure, and feel your unique expression unfold in whatever form it may take in your heart. The Wisdom Tradition evolved over the centuries to address our deepest human needs. Sarah Fuhro is a practitioner of its many forms; including Astrology, Tarot, Flower Essences and Druidry. In addition to personal consultations, Sarah teaches workshops and private classes, offering both clients and students knowledge powerfully rooted in the past, presented in the language of the present. To learn more, please visit www.sarahfuhro.com. 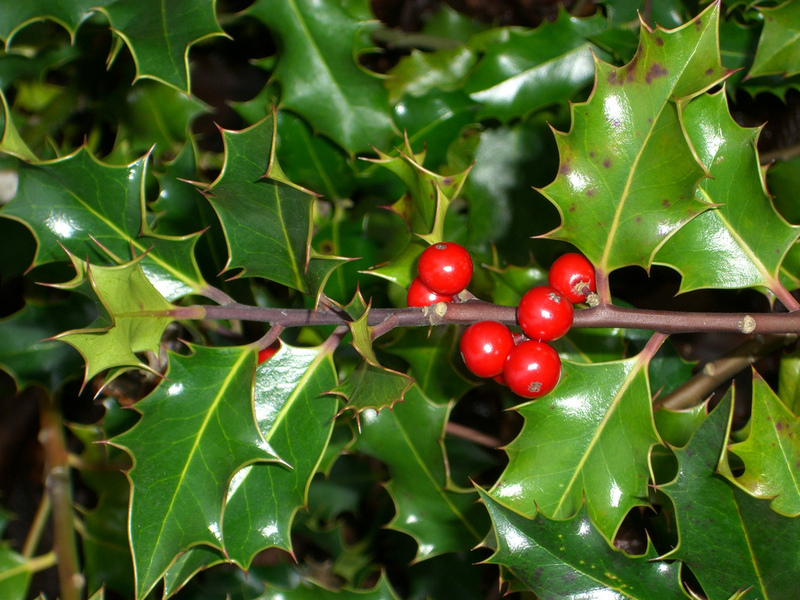 Holly is a tree of protection. He is called ‘best in the fight.’ The Holly King after his battle with the Oak King at the Summer Solstice is victorious. He will once again lose the battle to the Oak at the Winter Solstice. So the wheel of the year turns with special treats at each season! Darkness grows for those of us who live north of the equator, while light is expanding his realm in the south. Our earth has limitless lessons to teach us about the balance between dark and light, the season of Holly and the season of Oak. Saturday, July 12, the Moon will fill again, and overflow. 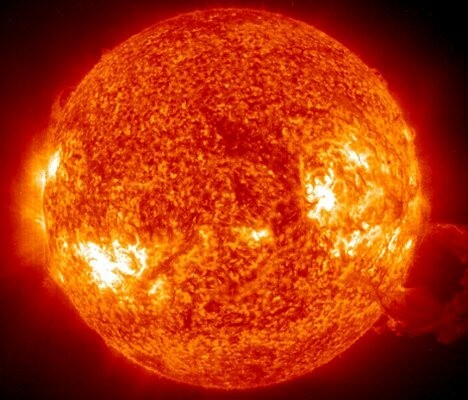 The Sun will be in the Moon’s sign, Cancer. The Moon watches from Saturn’s realm of Capricorn, the builder. For those of us in the Eastern time zone of the United States, the moment of perfect fullness will take place after the Moon has set (7:24 AM EDT), but with a day of full Moon energy rising before us. This moment has a powerful set of squares from other planets and heavenly points, which will enrich our opportunity for service to the earth, if we choose to align ourselves with our home planet and with ourselves. The planets aligned with the opposition between the Sun and Moon send a message about the need to face some problems, which can only be solved if we release our sense of victimization. Pluto and the Moon, for example, speak of exploring fears, which keep us from realizing our dreams of what we can accomplish (Capricorn). Uranus, in fiery Aries squares the Sun and Moon and jolts us into an understanding that we can be constructive or chaotic in the revolution. The nearby South Node reminds us that we have been here before, and have chosen anger or destruction as a reaction to new aspects to our lives. Meanwhile, in Libra, and also square to the Sun and Moon we have Mars, Ceres, Vesta and the North Node. This creates a powerful Grand Cross. When we feel the pull of opposite forces in our life and in our desires, we need to stop to be in the moment, to feel the center of that immense energy for change taking place. Yeats expressed it for his time, now it is our turn. 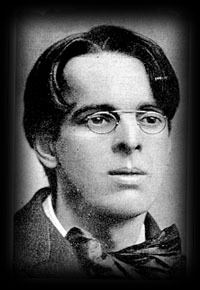 The Tower card was Yeats’ favorite. For him it represented a new round of poetic inspiration. For all of us, it can be a reminder that crystallized forms, which isolate us, will not stand. 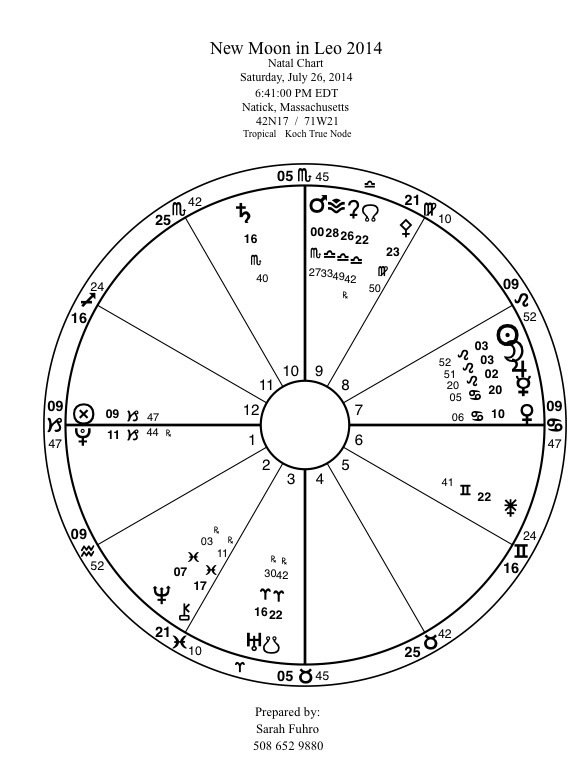 Mars, Ceres, Vesta and their alliance with the North Node, opposite to Uranus and the South Node, square to Sun and Moon and trine to Venus and Mercury, are the musicians for this chart. It will be their drumbeat, which will lead us on the evolutionary development, if we take the time to listen! For the human population to awaken to the message of Ceres, we have to break through our isolation in an air conditioned tower. What action we take will have much to do with the assignment Ceres and Vesta offer us in our chart. Each person has a unique way to honor and protect the planet. The warrior Mars is closely aligned with Ceres and Vesta in this chart. 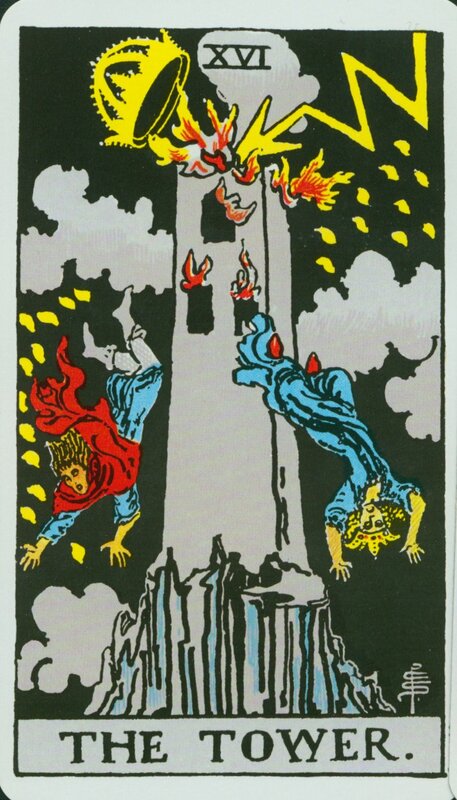 The Tower card corresponds to Mars, and tells us the consequences of staying home for too long. The tower pictured in the card, shows a structure with no connection to the rest of the environment, there are no neighbors, no forest or meadow or sea side surroundings. Mars comes to shake us out of our cage. Uranus and Pluto will join in from the other arms of this cross. It would be better if we come down without the lightning bolt, of our own accord, to embrace what we don’t yet know. Sun and Moon in Cancer and Capricorn will brighten our skies this July. Home and work (Cancer and Capricorn) will be the canvas of our creative work. Are these two realms in harmony or conflict in your life? The Wisdom Tradition evolved over the centuries to address our deepest human needs. Sarah Fuhro is a practitioner of its many forms; including Astrology, Tarot, Flower Essences and Druidry. In addition to personal consultations, Sarah teaches workshops and private classes, offering both clients and students knowledge powerfully rooted in the past, presented in the language of the present.